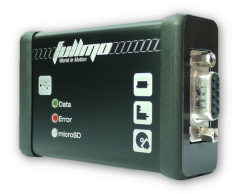 The fullmo USB2drive is a small and easy-to-use CAN Bus interface via USB, and the recommended CAN Interface for the fullmo Kickdrive software. It can be used for high-speed CAN networks of up to 1 MBit/s, and supports CAN 2.0A and CAN2.0B data frames, including CAN Remote Frames. The fullmo USB2drive/485 device offers additional RS485 drive support (e.g. ebmpapst K4 series) and SD card support for software updates and future applications. •Dual CAN channel architecture and 10 microseconds time stamp resolution for accurate CAN bus monitoring. •Hot-pluggable operation: fullmo USB2drive can be removed and plugged back in during operation. •Automatic software update and management via fullmo Kickdrive. Available in our Online Shop. See the fullmo USB2drive datasheet for more information.